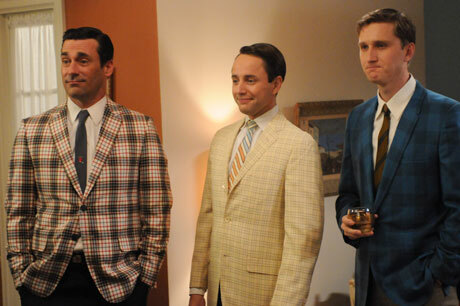 COOL: Mad Men S5 E5 ‘Signal 30’ | Everything is cool. Let’s start with this tidbit: this episode was co-written by Frank Pierson, the Oscar-winning screenwriter of Dog Day Afternoon, Cool Hand Luke and Presumed Innocent (among other films). And this episode was all about the writing. All the ideological issues that I would not want to gloss over—can we ever please see anything from Trudy’s POV? Are we back to ignoring Dawn now that she’s had her 3 minutes of lines? Damn, this show is all white men all the time!—fade to the background because of the sheer brilliance of how this tired old trope (life in the suburbs isn’t as perfect as it seems!) is made completely new and terribly affecting. This script reached a depth that had me at “because he’s a robot” and killed me with “I have nothing!” and I felt what I think can only be the universal human sadness of having everything you thought you wanted but being utterly, completely empty inside. 1. Guys, what is happening to Don? What’s this “reformed man” deal? I, for one, am not buying it. I’m convinced by his ‘dream’ last week that there’s something truly vile still lurking under the surface, and I’m further disturbed by his throwaway comment to Pete in this episode that if he had been married to Megan the first time around, he “would’ve known better.” I’m sensing a bit of a trend of blaming the woman he’s with for his problems with infidelity, which is neither cool nor helpful. At the same time, Don lets Megan take a much more active role in their relationship than he ever did with Betty: Megan insists that Don call Trudy if he wants to cancel; she gets him to wear that (hideous!) jacket; she drives. The quote above about the country “killing him” applies equally to Don as it does to Pete, methinks—he is so desperate to not even spend one evening in the suburbs. If he had truly moved on, this shouldn’t faze him as much, right? There is a strange sense this season, I think, that Don doesn’t really feel comfortable in his own skin. The persona he had for so long (Don Draper, Advertising Phenom!) has ebbed away, but whatever he is now seems very transitional, something that cannot really be sustained. He did seem at his most comfortable taking off his shirt and fixing the plumbing—maybe Don needs to start getting his hands dirty again. 3. Joan was ALL CLASS in this episode. I am very, very glad that Mad Men hasn’t gone the route of so many other tv shows, teasing us with Unresolved Sexual Tension between Joan and Lane: will they or won’t they? Are they each other’s One True Soulmate? They tried it out, Joan indicated she was not interested, and now (I’m hoping) they can forge a true bond of friendship, something depicted rarely in popular culture. ← COOL: Promoted. Episode 1.